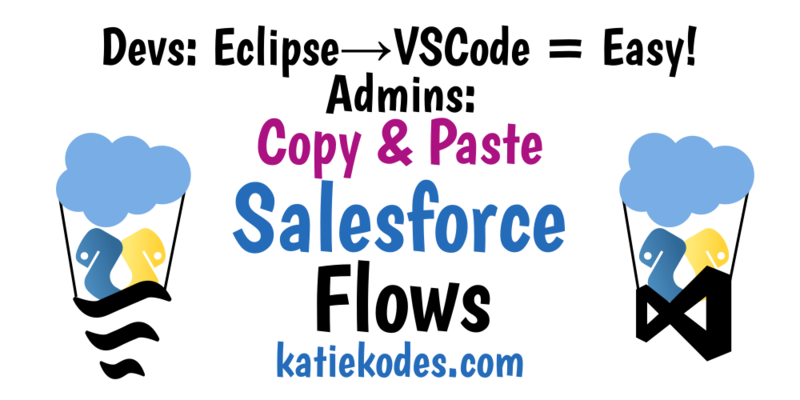 A colleague wanted to edit the XML behind Salesforce flows so she could quickly copy/paste entire flows, copy/paste variables within a flow, etc. Here’re the instructions I sent her for Windows. Developers, you can skim the deep dive into downloading, editing, and re-uploading a flow’s XML, since you probably already know exactly which files you’re trying to edit. Administrators, the idea behind this post is that sometimes, it’s faster or easier to change the structure of your Salesforce org by downloading files representing that structure to your local computer, editing them, and re-uploading them to Salesforce. Think of it like using the “Data Loader,” but for your org’s structure instead of its data. Nevertheless, the principle that you can make certain changes to your Salesforce org faster with code than you can with clicks may remain true with other pieces of your org’s structure, so I’ll leave the tutorial up even after “copy-paste” comes back in the web-based flow builder. The process of trying to edit my org’s “metadata” with VSCode instead of Eclipse was not nearly as bad as I thought it’d be. For well over a year, having heard bits and pieces of information about “DX,” I thought I was going to have to change everything about the way I pushed code to Salesforce, having been an Eclipse and “Force.com IDE” user for years. Super! No learning new things about SFDX packages! No worrying about managing Git repositories in new ways! Salesforce’s official support for Eclipse is ending in six months, so it’s nice to have my moves down to make the switch to VSCode myself. Thanks also to Nick Lindberg and Zayne Turner for evangelizing “VSCode for admins” so effectively and persistently (I got the hint!). Not to be confused with the more common Java SE JRE (“Java Runtime Environment”). This version is aimed at coders. Aren’t you fancy now? Note that a failed installation of any piece of this process could impact the next piece of the process. Generally, if you have a choice of whether to let the installer add things to your “PATH environment variable,” you want to let them do so (it’s what makes codewords like java and sfdx be recognized by your computer’s command-line interface as valid commands that can take options and do cool things). Download an installer here from Oracle. You want the first box of options. Pick the appropriate installer for your computer (favoring 64-bit over 32-bit installers unless for some weird reason you need 32-bit). Download an installer here from Salesforce. You should be able to test that it worked by opening a Windows command prompt (windows key on your keyboard, cmd, enter) and typing sfdx –version and hitting enter. If you see text about the version as a response, yay. Type exit and hit enter and move on. If Windows complains that sfdx is not a command, something went wrong with the JDK or the Salesforce CLI install. You’re not going to get far when you try to do stuff in Visual Studio until you fix this. Download an installer here from Microsoft. In some ways, you can think of an IDE as a souped-up text editor, like Notepad++. In this case, it’s the souped-up text editor of choice for dealing with the “metadata” text files that represent the way your Salesforce org is configured. Like Chrome, there are a lot of Salesforce-related plugins available for it. Also like Chrome, you really shouldn’t install a plugin without a good reason to trust it. We’ll start by just installing the ones that Salesforce publishes in our next steps. Once you’ve installed Visual Studio Code, visit this page of Visual Studio’s “marketplace” in your web browser and click the big “Install” button at the top. When your browser asks if you want to open the link with Visual Studio Code, let it. Follow any prompts, but I think you should be good to go pretty fast. This official documentation has screenshots of most of the steps below. (My colleague was connecting to a sandbox called “Staging” in a new org we were spinning up to start from scratch with HEDA). In the “Select Folder” Windows Explorer pop-up, create / find / navigate to a folder that seems like a good spot on your hard drive to keep copies of the code representing the contents of the org you’re about to download from. You’ll see a “Welcome” thing with some folder navigation at left that’s collapsible under the phrase “HEDA — Sandbox - Staging,” or whatever meaningful name you came up with. At this point, if you were to browse your hard drive, you’d notice a folder called C:\Users\YOUR_USERNAME\Documents\Codebases\Salesforce Orgs\HEDA --- Sandbox - Staging\ or something similar. Choose “Sandbox” if you’re connecting to a sandbox, etc. Log in to whatever Salesforce org you’re trying to connect to as yourself. Now you need to download text files called “metadata” that represent the current state of your Salesforce org onto your computer so that it’s easy to edit their contents. Salesforce only lets you edit a tiny bit of the “metadata” in your org directly through the web site’s Developer Console (e.g. Apex triggers & classes). All other “metadata” code has to be downloaded to your computer, edited there, and re-uploaded to Salesforce if you want to edit it directly. Back in VSCode, at left, under the navigation for the “project” you just created and gave a nice name, expand the folder called “manifest” and double-click “package.xml” to open it in the text editor area of VSCode at right. Do you know how to read XML? Check out my tutorial if not! It’s probably about 30 lines long and contains text between “types” tags with code meaning things like, “Download all Apex classes to my hard drive from Salesforce,” “Download all Custom Settings to my hard drive from Salesforce,” etc. Edit the file. Carefully. Read my XML tutorial if you’re nervous. What you’re trying to do is leave only “<type>...</type>” tagsets in the XML you need. Delete “<type>...</type>” tagsets you don’t care about (you don’t need to see the details of Apex Triggers if you don’t program them – it’s just going to make the download take longer). Be sure not to accidentally delete the “<version>...</version>” tagset from your XML when deleting “<type>...</type>” tagsets you don’t need. Add new “<type>...</type>” tagsets you do care about (learning exactly what to type is a bit of an art, but it’s usually pretty intuitive for most things if you start with an example), such as one for “Flow” if that’s what you’re trying to edit. You can close the editor window for package.xml now. That’s all that goes in package.xml! Not so bad, right? This is known as “retrieving” code. When the little status box at lower right says you’re all done, close up “Manifest” at left and expand the folders “force-app,” then “main,” then “default,” then “flows” (presuming you meant to download flows). Do you see a lot of files? Yay! Open one up in the VSCode file editor by double-clicking it. Make it one that’s still inactive and a first draft, and that you don’t care much about if you break it. Make some sort of relatively foolproof edit. e.g. Copy & paste a “<variable>...</variable>” tagset and type a new value inside the “<name>...</name>” tagset embedded within. Do you know how to read and write XML? Check out my tutorial if not! Save your work (File->Save or Ctrl+S). Close the editor tab for the file you just edited. Here’re 4 screenshots of a flow I created with the web in Salesforce. Nevertheless, the “copy-paste”-ability of the text file can’t be beat. I’m just going to copy-paste Variable_01 to be a 2nd variable, Variable_02. This is known as “deploying” code. Unfortunately, you can’t ctrl+click multiple files and deploy them all at once this way. Only one file will actually deploy, even though they all look selected on your screen. Similarly, you can right-click on package.xml to deploy all XML files mentioned therein from your computer to Salesforce. This has the same “you might be deploying old code” caveat. Open your Salesforce org, back out of your flow if you were editing it, re-open it, and see if the magic worked! Do you have a new variable in your resources? Now play with your flow in the web interface. Caution: Don’t click the adjacent “deploy” option! Unfortunately, “Retrieve” & “Deploy” are right next to each other. Q: Why wouldn’t it be safe to deploy? A: As you’re aware if you’re trying to “retrieve” code fresh from Salesforce, the copies of code on your computer are out-of-date. Accidentally clicking “Deploy” instead of “Retrieve” could overwrite hard work you’ve done through your web browser with no easy way to recover. If I use VSCode re-open the XML file containing a representation of my flow, after re-downloading the latest version of it, I can see that it’s longer than it used to be..
Change 1: Within the <assignmentItems>...</assignmentItems> tagset representing the assignment called “Save Name,” an entirely new <assignmentItems>...</assignmentItems> tagset has been added to the code setting the value of Variable_02, just like I did with clicks. Hooray – I successfully updated my computer’s copy of the XML code to keep it in sync with what’s going on in my Salesforce org through web-based edits. If you’re a developer, now you can finally be less afraid of Salesforce ending support for Eclipse. Thanks for making it all the way through!